Posted on March 22, 2018 . by Patrick Johnstone. Leave a comment. Politics is a hell of a business. For the rest of us who slept through Statistics 101, an R of .92 is a pretty high correlation, so I can definitively say popularity as a Premier in Canada correlates negatively with time in office. 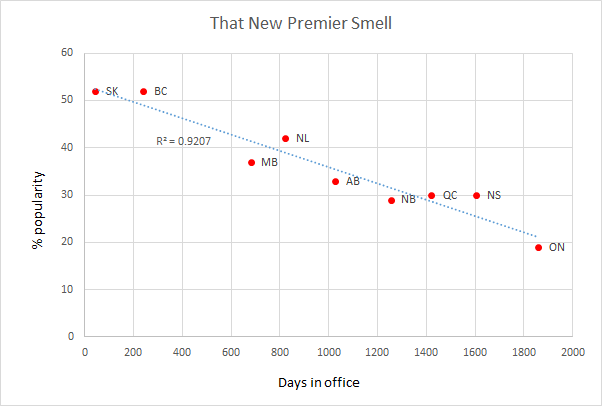 Any Premier above that trend line is doing better than average, any premier below the line is doing worse than average. Arguably, Pallister is doing worse than McNeil on average, but you know which I would rather be going into re-election. Because in politics, it doesn’t seem to matter if you are above or below the line here. 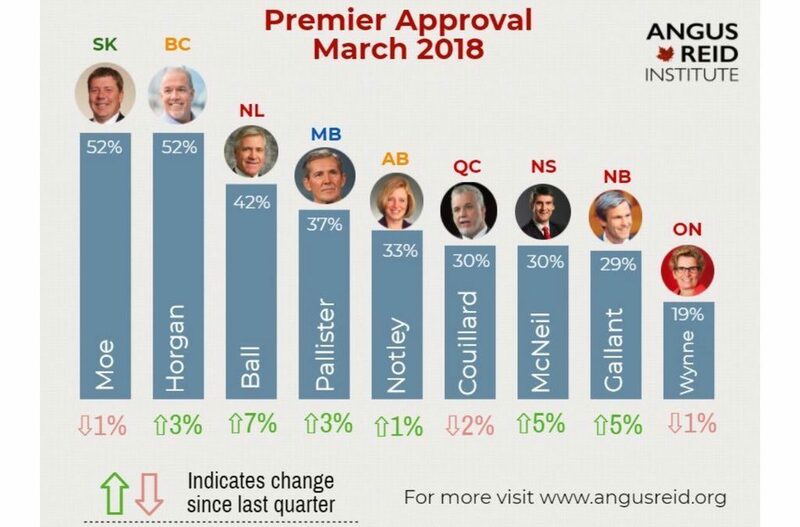 The only lesson to be learned from this graph is that the best you can hope for in Provincial Politics in Canada is to get things done before that New Premier Smell wears off. As years in office accumulate, any successes or victories are quickly weighed down by a legacy of being to blame for everything that may have gone wrong. Inevitably some of that is your fault (no one is perfect) and some is beyond your control, but in politics at the highest level, it simply doesn’t matter. The only good way out of politics is to recognize when the door has been opened for you, and get out. Problem is, that kind of self-recognition is the first thing to be eroded by electoral success and access to power. Entering politics in the first place requires hubris, time in politics increases hubris, getting out requires absence of hubris. You can see the problem here. I’m not sure how this plays out at the Municipal level, but I am just going to leave this post here, and hopefully someone will point it out to me when I am considering my 6th term for Council. Posted on March 14, 2018 . by Patrick Johnstone. Leave a comment. Our Pre-Spring Break meeting had a lot of public participation and delegations, and also came after an afternoon Workshop where we discussed implementation of the Heritage Conservation Area in Queens Park (worth watching the Video if this topic is interesting to you). The City will once again be sending Councillor Williams to Lijiang as part of our Sister City and Student Visitation policies, and will fund this from our International Relations fund. I have my own ideas about where the City could benefit better from an International Relations program than this, but my thoughts are still somewhat half-formed, and I guess I will write more about that after giving them a little more work. This is part of what I think we can do better with our international Relations process, and can be a major part of our reconciliation efforts in the City. Recognizing the nationhood of the First Nations in this province is a huge step towards rectifying our common past, and Councillor Puchmayr’s efforts as a representative of the City to build a positive relationship with the Tsilhqot’in is groundbreaking. I love the idea of holding an event here in the City, in the model of a gathering. I think the spirit of reconciliation would have us first asking representatives of local first nations to permit us to hold this event on Coast Salish lands, and of course to invite them. At the ArtLatch held at the Massey Theatre earlier this year there was an interesting revision of a great meeting that occurred in New Westminster between then-Governor Seymour and the assembled Chiefs of the region and colony. The young artists used transcripts of the meeting to demonstrate how people talking past each other, empowered by patriarchal and colonialist attitudes, stood in the way of communication. The colonial interest in getting business done failed to acknowledge the need to first establish a relationship or even seek a common set of understandings. Too often today, we fall to this same trap. As a community (and as a Council representing the community) we need to get back to building these relationships and understanding one another. A gathering may give us the opportunity to begin on this new path towards understanding, if we are brave enough to put our egos and preconceived notions aside, and share our stories. There was a bit of an adjustment of the membership of ACTBiPed coming out of the recruitment for the 2018 committee selection process and scheduling. We needed to update our Bylaw that permits the use of those automated ballot-counting machines to align with new provincial regulations and language. Another change was identified since we gave this Bylaw third reading, so we need to rescind that third reading and re-do it with the amended Bylaw. Hey, folks, there’s an election in October! With the new HCA in Queens Park, we need a formal process to move houses between categories, to either extend further protection to an identified heritage asset not caught in the first-draft classification, or to reduce the protection of a house that is old, but so heavily modified or degraded that it no longer carries any heritage value. One of the principles established while setting up the HCA was that this should be a transparent process that isn’t too onerous. The regular OCP Amendment process may be described as onerous. It requires multiple committee reviews, Council approvals, and stages of public consultation. A diligent applicant may navigate this process in 6 months, and will not know the result until after a potentially-confrontational Public Hearing right at the end of it all. The proposed “Streamlined” process would still include committee and Council input, and a Public Hearing, but may be completed within about a 6 week window, by relying on the application meeting a set of requirements and conditions established through the HRA consultation process. This is not about skipping review or ignoring our due diligence, it is about creating a process that makes the necessary bureaucracy operate more efficiently. The spring freshet report is getting slightly worse, with some larger-than average snow packs in the Fraser River Basin. There have also been big snow accumulations late in the season in the Kootenays (mostly those go to the Columbia, not the Fraser). We keep an eye on this to inform our flood preparedness. Nothing to panic about yet, but there is a slightly enhanced interest, as flood risk so much depends on the rate of melt as it does on the accumulation. It is a la Nina year, which would usually suggest a slower rate of melt. The good news is that local snow packs are high, which bodes well for our summer water supply, but similarly much of this depends of the speed of the melt and how much we need to spill out of our reservoirs in the spring. We are doing some work to make the pedestrian realm safer and more pleasant in Connaught Heights. This includes improved sidewalks and lighting on key routes, mostly connecting to the 22nd Street Skytrain station (through partnership with TransLink). There will also be some enhancements to the traffic calming measures in the neighbourhoods, coming after extensive consultation with residents and the RA. I’m also glad to see there will be some improvements of the paint treatment on 20th to (hopefully) reduce the blocking of the intersections at 8th and 7th by queuing traffic. We need to update/upgrade another pump station in Queensborough – another one of those pretty-much-invisible but rather expensive capital projects the City is working on. Because this is a primary flood control measure, it is applicable to a provincial grant program to help finance emergency preparedness infrastructure. Let’s hope it gets granted! The City’s Electrical Utility has a long-standing practice of adjusting electricity rates to mimic BC Hydro rates. We buy from BC Hydro at wholesale rates, sell at retail, and with the difference we pay for the infrastructure and capital costs of the utility, and still return a dividend to the City that offsets a few million dollars in taxes. A few months ago as we were doing budget planning, the Electrical Department provided a forecast of rates going up 3% to match the BC Hydro increase. Then the provincial government applied to the BCUC to freeze rates for a year, which frankly threw our capital planning into a bit of a twizzle. When the BCUC denied the rate freeze (recognizing BC Hydro’s own capital planning needs) it put things back on track for us, for the meantime anyway. So your electricity rates will be going up 3% next year, like everyone else in the province. This idea has already been reported on, but this update includes the response from the Municipal Finance Authority to calls from several municipalities (New West is not alone here) to consider fossil fuel divestment. No need for me to rant again (you can read this if you want to dig into it), but I am glad we are making a little progress in pushing for Ethical Investing options, and am happy to bring this topic again to the UBCM. It is interesting to contrast this action with recent calls for “ethically responsible” businesses like MEC to stop carrying goods produced by companies who make money selling assault rifles. There are many ways to frame the ethical investing argument, but only one way to frame the alternative view: that it is the job – nay the Professional Responsibility – of our investment brokers to return the highest value possible to fundholders, and anything that constrains their decision making (be it ethical concerns on the part of fundholder or new regulations) may possibly impinge upon their ability to Act Professionally. This, in summary, is how Capitalism flaunts the line between allowing and encouraging unethical practices, from poisoning rivers to selling dangerous weapons to dangerous people. The City will continue to call on the MFA to explore more ethical investing options, and will also work with our partner municipalities (Victoria is already on board, along with a few others) to get enough capital commitment together to make this happen. This is another one of those gut-check times. I think this City does more than most, perhaps more than any other of our size, on the housing affordability file. Through stellar work by our staff, we have supported a variety of programs to address homelessness and housing affordability. Some may (and do) argue this is something we should leave to senior government, and I wish they provided all of the resources to do the work that needs to be done, but they have not in the past, and I don’t think we can just ignore the gaps that exist in our community. It is a time that rental vacancy is below 1%, prices are skyrocketing, and when regional pressures are being felt locally. When people face renoviction in this market, are priced out of housing, are transitioning out of healthcare or fleeing unsafe domestic situations – who are they going to call? Federal government cuts to homelessness outreach have taken more than a quarter million dollars out of local outreach funding. 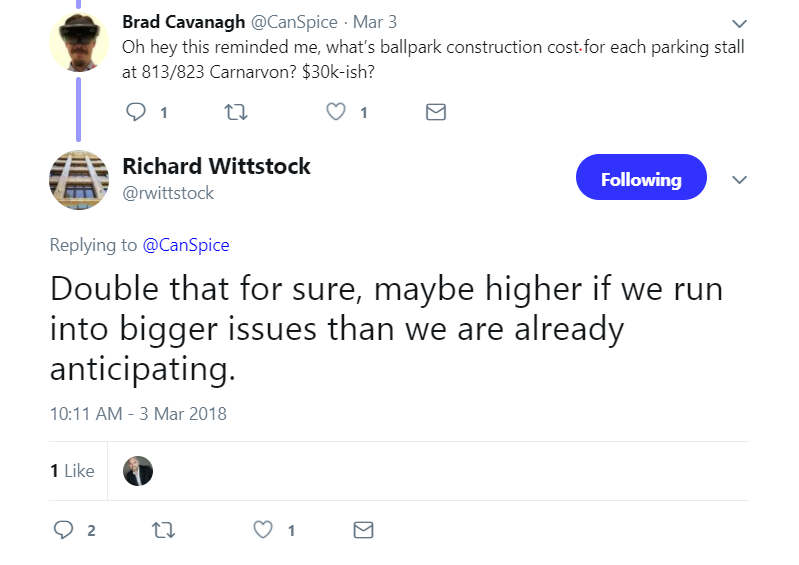 This is another gap we can hardly afford to ignore, and our Social Planning folks working for the City have been overtasked trying to cover this. This initiative would fund at least a part-time position to continue this important outreach work. We have the potential to share a person with another adjacent community with limited resources, in order to save money and provide better connections to a wider range of supports. We also hope that the province will step up and help fund the position. I completely support the need for this position, and hope through partnership we can manage the cost. The regional policies on water shortage are being subtly adjusted to reflect better consumption research and public feedback. There will be a few changes on what is and is not permitted under Stage 1 – Stage 3 water shortages. These rules are developed at the Metro Vancouver level (our water utility is a regional function), but there is a partnership between Metro and the member Municipalities to educate and enforce. This Bylaw that aligns our Municipal water shortage response plan with the updated regional plan, as discussed above, was given Three Readings. This Bylaw that updates our electrical rates to match BC Hydro rate increases, as discussed above, was given Three Readings. This Bylaw that regulates the automated ballot-reading machines we use in the Municipal Election needed some modification to better match the new provincial regulations. We rescinded the Third Reading from last meeting, and did a Third Reading of the amended Bylaw today. After another compelling presentation by advocates, and what was frankly a remarkably long conversation around an item that all of council easily supported, Council voted to endorse the Community Health Centre model, and ask the Provincial Government to do something about it (via the UBCM). 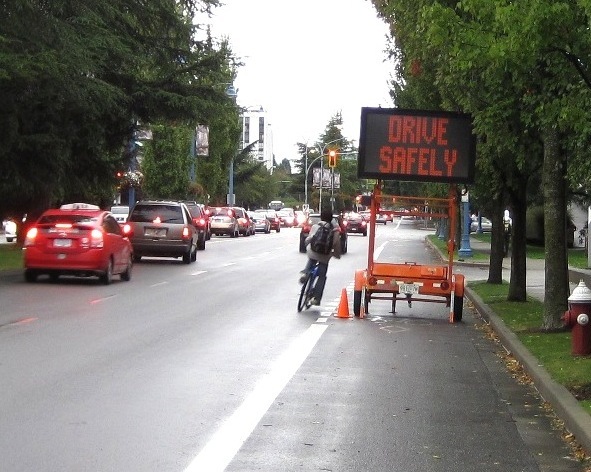 Following up on a recommendation from ACTBiPed as endorsed by Council at a previous meeting, we moved to take our support for the Road Safety Law Reform Group recommendations to the LMLGA, and ask the provincial government to update the Motor Vehicle Act to protect vulnerable road users. Council asked Staff to bring a report as soon as possible on the community consultation for the proposed replacement Skate Park. With the highschool project getting ready to break ground, I am afraid we are going to have an extended period without a skate facility in the community if we delay construction past this summer season. We need to decide whether the location we have is the one we are going with, or if we need to retool, but we cannot delay that decision any longer. And that brought the meeting to a wrap. Hope everyone has a good Spring Break, and we’ll see you back at Council on April 9! Posted on March 6, 2018 March 6, 2018 . by Patrick Johnstone. Leave a comment. This proposal will bring a new 32-story tower to the downtown tower district with 206 market strata units. The building will share a 3-story pedestal with a second, 8-story tower that will have 66 non-market rental units run by the Performing Arts Lodges, a not-for-profit that helps provide affordable housing for veterans of the performing arts industries. I will write a follow-up post on this development, but short version is Council voted to give the project Third Reading. This presentation by senior staff is an annual review of the work done and projects completed. Things are crazy busy in the City right now, partly driven by the (region-wide) pace of growth, partly by Council’s increasingly ambitious plans for moving the City forward in a lot of different directions. I will do a follow-up blog post to talk a little more about this, but short version is staff are running full gas, and I appreciate their work. This minor change in our calendar will permit a workshop on cannabis regulations on June 18th. Please adjust your social calendar appropriately. This older Strata apartment building is in need of some significant envelope repairs, and the owners have decided to do some upgrades to the building appearance and landscaping at the same time. The total estimated costs of the repairs is high enough to trigger the need for them to apply for a Development Permit. The Brow of the Hill RA supported this project, as did the Design Panel, and the neighbours have been notified and have not raised any objections. Council moved to issue the Development Permit. This Heritage Revitalization Agreement for a house in Queens Park will provide Heritage Designation and significant restoration of a heritage home in exchange for some allowances around a laneway house on the back of the property. Council gave the HRA two readings, and the project will be going to a Public Hearing on April 30, 2018. C’mon out and let us know what you think! • Broader public Wi-Fi connectivity – expanding the advantage of BridgeNet to make internet connectivity more available, and more equitable. Council moved to support this initiative with funding from the Intelligent City budget. As previously reported, we are meeting our GHG reduction goals in every sector except our fleet, which was thrown a curveball last year with the protracted snow/ice event and concomitant increase in vehicle mileage for our road maintenance vehicles. Council is not daunted, however, and we plan to set some aggressive targets for the next phase of our CEERS. I will address the fleet issue in the item below where we talked about our shift to alternative fuels. This HRA project in Queens Park will provide Designation of a heritage home, along with some restoration right away and some longer-term restoration/upkeep commitments in exchange for some accommodations for a laneway house at the back of the property. The project has not yet gone to First and Second reading, however, because it is a little hung up on the timeline for replacement of the existing vinyl windows. There are multiple opinions here about the windows. The Heritage Consultant working on the house has suggested that replacing the functional and high-efficiency vinyl windows (which are not, naturally, heritage-appropriate materials) at the end of their functional life, citing the cost and impact of breaking the envelope of the building and doing intrusive work when it isn’t immediately necessary. Some heritage conservation advocates (including the Community Heritage Commission) wanted to see the windows replaced sooner, or even immediately. Prior to drafting the Heritage Revitalization Agreement between the homeowner and the City (which will go to Public Hearing), Staff asked for some clarity from Council on how far we should push the window issue. I was concerned we were missing the forest for the trees here, and think the long-term heritage preservation of such a well-cared-for home for the decades ahead is more important than the short-term heritage “win” of replacing the windows right away, as the consummate costs may put the entire project in jeopardy. I am happy with the commitment to replacement of the windows with appropriate wood-frame versions, on a timeframe appropriate for the long term viability of the house – be that end of life or sooner – and securing that commitment with a covenant or in the language of the HRA. There were several options provided to council, reflecting the varying opinions of the Community Heritage Commission (replace within 10 years), Advisory Planning Commission (replace windows at the end of their service life with heritage-appropriate units), and the proponents (replace street-fronting windows within 10 years, the rest at the end of their service life). After some discussion, Council chose to support the proponent’s proposal, with the addition of a cosmetic treatment of the current windows to address the non-heritage-appropriate colour; a compromise that may slightly disappoint everyone. But I guess we will find out at the Public Hearing. Staff continues to work on the incentive programs planned for the Queens Park Heritage Conservation Area, along with development and consultation on some of the other implementation measures promised as part of the HCA. Several of these proposals were easily supported by Council, but the one part around the process through which homeowners with protected properties could apply to have a preliminary evaluation done of their property to determine if they lack heritage value to the point where they could be moved to Limited Protection status lead to some discussion and clarification. In the end I supported all of the staff recommendations (and all were passed by Council). This is an ongoing project, and a healthy discussion on Council is important, even when especially when we disagree on some points of language and policy. There is a bunch of work to do yet here, and there are upcoming public meetings on these initiatives, so stay tuned! The proposal to build a large Banquet Hall on an undeveloped piece of land adjacent to Queensborough Landing is going through an extra level of review, as the proponents have determined the best way to meet their parking requirements is to build a parkade, which is resulting in a redesign of the building shape and form. A little while ago, we asked staff to provide us an update on our efforts to shift our fleet to lower-emission and zero-emission vehicles. 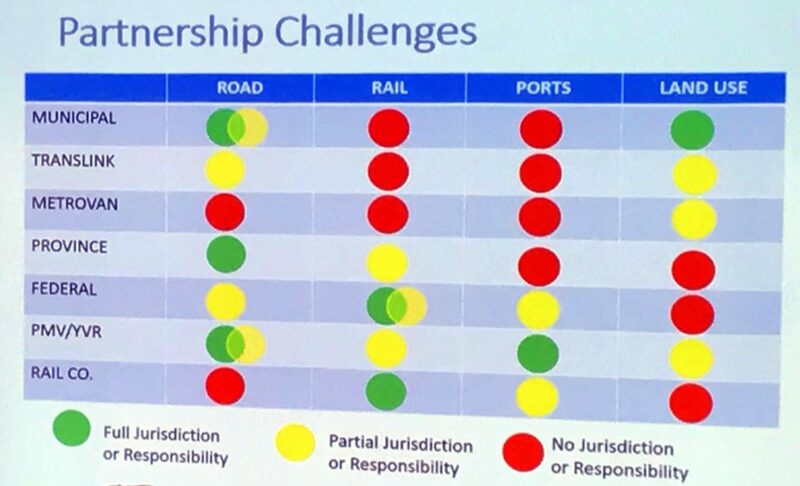 This is related to the discussion around fleet being the one part of our Corporate Energy and Emissions Reduction Strategy (above) that isn’t hitting targets. Of course, the issue is more complex than just saying “we need to stop buying gas/diesel vehicles”. 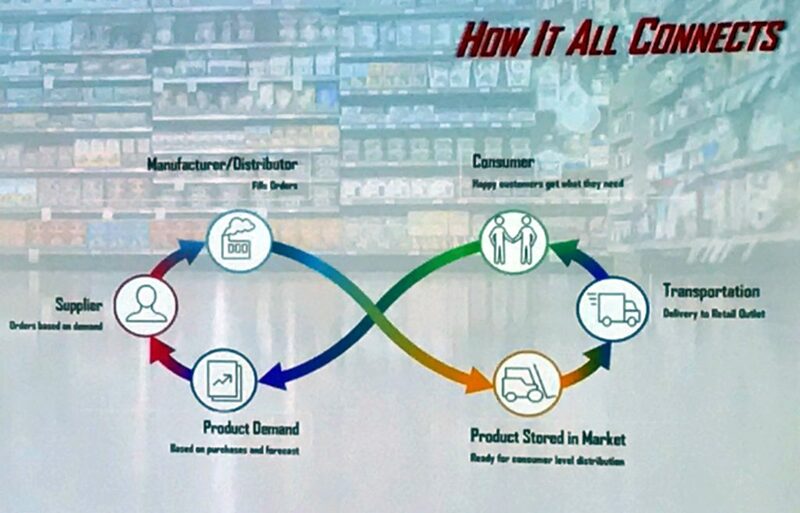 We have a legacy fleet and the technology available for small consumer cars (like the Nissan Leaf the City has in its pool) is not expanding to other vehicle types as quickly as we may like. Just try to buy an electric (or even plug-in hybrid), pick-up truck. They don’t exist. That said, technology is shifting fast. Vancouver is testing an electric garbage truck that can do a 10-hour shift on a 2-hour charge, but that is definitely not a mainstream technology, and we cannot yet evaluate the lifetime costs. We also have everything from backhoes to field lawnmowers and firetrucks that are not likely to see total electrification soon. Our Police are doing a good job with propane-hybrid vehicles and new anti-idling practices, and our fire services are now using separate diesel generators to run on-board systems so the drive engine can be shut off during extended deployments. As stop-gap measures, these are great, but not the end of the discussion. Its not a matter of if we are going to move to a complete low- or zero-emission vehicle fleet, but when. Even if the pressures of carbon pricing (going up!) were more important than the fact it is 20 degrees above normal today in parts of the Arctic, the emergent health impacts of diesel pollution in our communities is enough to make the case for a shift to a cleaner, greener fleet and fleet practices that reduce engine idling and fuel use. Council emphasized that New Westminster has its own electrical utility (vertical integration! 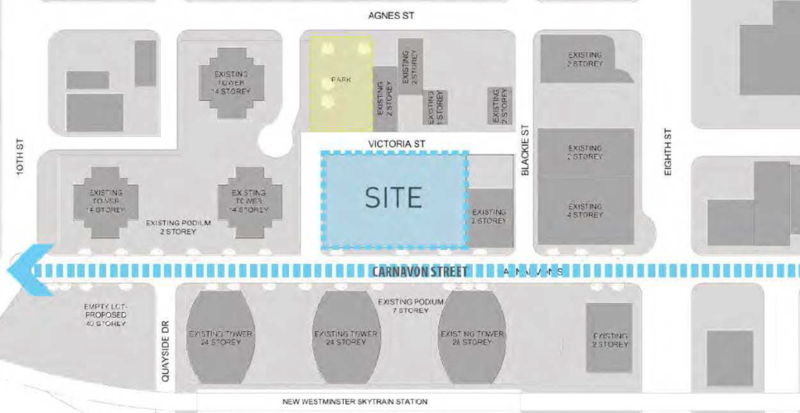 ), is a compact City with high population density within a small area, and has a Council that has demonstrated its interest in finding innovative approaches to problems and expresses an environmental ethos – if New West can’t lead the region (or even the country) on this file, I don’t know what City could. Council called on staff to continue to be innovative and see where they can push some limits here to make our fleet cleaner. The City provides subsidies to people who wish to apply nematodes to their lawns to battle the Chafer beetle and the animals that tear up yards to feast on them. I have some concerns about us continuing to invest in a losing battle here. This is a subsidy to single family homeowners to maintain green lawns, when there are alternatives available, including better turf care practices or alternative lawn covers. The Chafer is not going away, and I wonder about the value of doing this for perpetuity. Regardless, I am aware that this is a bigger policy discussion, and am happy in the short term to continue the program until we can come up with a better understanding of a long term strategy. These Bylaws that support the heritage restoration and designation of a house in Queens Park in exchange for allowances around a laneway house, as mentioned above, were given two readings. They will go to Public Hearing on April 30. C’mon out and let us know what you think. This Bylaw that formalized our 5-year financial plan which was given Third Reading on February 19, was formally adopted. It is now the Law of the Land. This Bylaw to permit a residential building in the Brow of the Hill which was given Third Reading on January 29th was formally adopted. Please adjust your behaviour accordingly. This Bylaw that makes a bunch of language changes to correct our Zoning Bylaw where it is incorrect, unclear, or didn’t rhyme was formally adopted. Please update all of your bylaw dictionaries and related hyperlinks. And that was another night of Council work done!